Book soon if you are interested…. A few hours at the watchpolnt with Steve Jones and Peter Jones and had a second lifer when a Lanner Falcon came over. ‘Wildlife of the Pyrenees’ is a fantastic new guidebook about the flora and fauna of the Pyrenees and it’s available in English! Books in English about the Pyrenees are few and far between so this a a very welcome publication. What’s great is that it covers such a wide range of topics with sections on wildflowers, birds, trees, fish, butterflies, mammals, reptiles, insects and even the breeds of cows, horses and sheep that you are likely to see while out hiking in the Pyrenees. With one book you can cover nearly everything you’ll see over here. It’s a must for any nature lover visiting the Pyrenees. Picked up another Spanish Lifer today at Bonanza Salt pans, along with Common Tern at Chipiona and Red Knot at Bonanza I found a very smart Red-necked Phalarope there as well. These birds got the year list up to 288 and the Spanish list to 340. 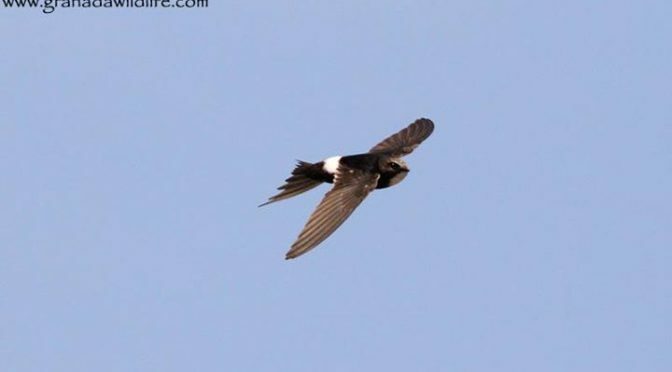 After a visit to Charca Suarez this morning with Steve Jones from Cornwall in the UK we visited a second spot not too far away where we had two hours watching up to 4 White-rumped Swifts. They were at time feeding just 3 meters away from us and we could hear the wind in their feathers they were so close, a very memorable bit of birding. This week we had 2 holidays running simultaneously. Many locations were explored such as the villages of Serrablo and the abandoned village of Susin and many peaks were climbed including the mighty Pico Musales 2653m. It’s been a great week thanks for everyone’s fun company!